We’d love your help. Let us know what’s wrong with this preview of Six Easy Pieces by Richard Feynman. It was Richard Feynman's outrageous and scintillating method of teaching that earned him legendary status among students and professors of physics. From 1961 to 1963, Feynman delivered a series of lectures at the California Institute of Technology that revolutionized the teaching of physics around the world. Six Easy Pieces, taken from these famous Lectures on Physics, rep It was Richard Feynman's outrageous and scintillating method of teaching that earned him legendary status among students and professors of physics. From 1961 to 1963, Feynman delivered a series of lectures at the California Institute of Technology that revolutionized the teaching of physics around the world. Six Easy Pieces, taken from these famous Lectures on Physics, represent the most accessible material from the series. To ask other readers questions about Six Easy Pieces, please sign up. Presents six of the easiest chapters from the Nobel Prize winner's celebrated text Lectures in Physics, originally published in 1963, which comprised the lectures he prepared for undergraduate students at Caltech in the early 1960s. Addressing key topics in largely qualitative terms without formal mathematics, the six selections discuss atoms in motion, basic physics, the relation of physics to other sciences, conservation of energy, the theory of gravitation, and quantum behavior. تصور غلط و رایجی هست که علم مقوله‌ای است فاقد جنبه‌های شخصی، بی‌طرف و کاملاً واقع‌نگر. فعالیت‌های انسانی‌ِ دیگر، بیشترشان متأثر از روندهای رایج، امیال و اشخاص‌اند. اما فرض بر آن است که علم محدود به قواعد و روش‌های پذیرفته‌شده و مقید به آزمون‌های بسیار دقیق‌ است. مهم نتایج‌اند. نه کسانی که آنها را به دست می‌آورند. There is not much more to be said about Richard Feynman’s impact on physics or science communication; the man is as bona-fide legend and as close to being a worshipable God as scientists can have. Six Easy Pieces is a collection of the ‘easiest’ six chapters from Richard Feynman’s most-celebrated text book The Feynman Lectures on Physics. The ‘easy’ in the title, is, like our sense of time, all relative. The lectures, delivered in the early 60’s, were aimed at “the most intelligent in the class There is not much more to be said about Richard Feynman’s impact on physics or science communication; the man is as bona-fide legend and as close to being a worshipable God as scientists can have. Six Easy Pieces is a collection of the ‘easiest’ six chapters from Richard Feynman’s most-celebrated text book The Feynman Lectures on Physics. We, as the general reader, are more like the ‘secondary’ audience for the lectures, who for Feyman at the time were the students “for whom the extra fireworks are merely disquieting and who cannot be expected to learn the material in the lecture at all”. Such was Feynman’s power of exposition, however, you can follow the science, each chapter getting progressively more complicated and abstract, without ever feeling like you’re being left behind. The final three chapters, on the Conservation of Energy, the Theory of Gravitation and Quantum behaviour are a little heavier, but no less interesting. There’s the occasional formula, which immediately starts the eyes glazing over, but, to the lay reader, they serve to remind you just how much of the book is mathematics translated into wonderful, approachable prose. I’ve read about things like Heisenberg’s Uncertainty Principle or the “double-slit” experiment, which showed that at the quantum level particles behave both waves and particles, many times before, but is actually the first time that I really *got it*. For that, I cannot recommend the book enough. For those looking for more pop-physics in a similar vein, I can really recommend Why Does E=MC2 by Brian Cox and Jeff Forshaw, Quantum by Manjit Kumar and Black Holes, Worm Holes and Time Machines by Jim Al-Khalili. Having now read Six Easy Pieces, I can see the obvious influence of Feynman on the not just their content but their delivery and style. There are also three prefaces to the edition of the book I read. Paul Davies’ introduction and David Goldstein’s special preface set the backdrop to the book and the lectures. The most interesting preface is the one written by Feynman himself for the original edition, in which he talks about how he set about piecing the course together, who it was aimed at and why, and how ultimately he felt that he had let his students down in some way. It shows just how much thought he put into the lectures and just how much he cared about educating his students. In some way, as someone enjoys teaching and talking about science, I learnt a lot from these few pages as I did from the rest of the book. So if anyone is familiar with Feynman's "claim to fame," it's basically the idea that he's the most brilliant Physicis teacher of the 20th century and his lectures are ingenius in both their presentation and method. Now, I'm not the most science-inclined person out there. I've never taken even a preliminary physics course (and these lectures were intended for his intro Caltech class, so...). But I'm also not dumb as a rock, either. With that said, I didn't understand much of this book. I could follow along vaguely and in general terms. But could I explain to someone else what gravitational energy is now? Definitely not. In fact, I can barely remember the different topics in the book now because of how little I actually retained about them. For people who think this is going to be a magical book that will teach what were once almost mysteriously complicated ideas with wonderful simplicity - think again. You would never become truly knowledgeable on any of these topics with only this small of an overview. But, if you are scientifically inclined, it might at least be interesting and prompt you to take your learning further. It does get more technical than I thought it would. Although nowhere near as technical as the topics actually go. Contains the best explanation for the uncertainty principle I have come across. Still trying to wrap my mind around quantum mechanics though. so this book (if you were at all interested) is a collection of the six 'most basic' lectures delivered by richard feynman when he taught caltech 1st year physics undergrads in the early 1960s. feynman is famously an excellent communicator and very good at explaining physics-y things and coming up with analogies. honestly though, i was a little disappointed. admittedly, i thought the chapter on quantum behaviour (6) was *fantastic*, and probably the best and most thorough explanation i've come ac so this book (if you were at all interested) is a collection of the six 'most basic' lectures delivered by richard feynman when he taught caltech 1st year physics undergrads in the early 1960s. feynman is famously an excellent communicator and very good at explaining physics-y things and coming up with analogies. honestly though, i was a little disappointed. admittedly, i thought the chapter on quantum behaviour (6) was *fantastic*, and probably the best and most thorough explanation i've come across. the maths was a little elusive and unexplained, but that didn't bother me too much as i'm sure i'll learn about it in time & it's not necessary to understand what's going on. but i would definitely recommend this chapter (which you can read online for free - http://www.feynmanlectures.caltech.ed...) to anyone to wants to understand quantum behaviour. + i did also enjoy the first two chapters in the book as well, which were on atoms in motion and basic physics. the rest of the book, however, was quite meh. the chapter on the relationship between physics and other sciences (3) was often very vague and seemed to be stating the obvious a lot of the time, although i did find it quite interesting in places (for instance the section on geology and biology, even if the latter seemed to drag on a bit). chapter (4) which was on conservation of energy was pretty confusing sometimes and otherwise pretty unmemorable. In these lectures, Feynman is very good at explaining some basic concepts for those fairly new to physics. For field theory, he uses the analogy of waves in a pool to show how motion in one place affects motion in a distant place. He says that matter goes straight unless acted upon by an external force, but we don't know why; that the earth is pulled toward the sun, as opposed to the earth moving around the sun; and that atoms are always in motion ("jigglings and wigglings of atoms") and that su In these lectures, Feynman is very good at explaining some basic concepts for those fairly new to physics. For field theory, he uses the analogy of waves in a pool to show how motion in one place affects motion in a distant place. He says that matter goes straight unless acted upon by an external force, but we don't know why; that the earth is pulled toward the sun, as opposed to the earth moving around the sun; and that atoms are always in motion ("jigglings and wigglings of atoms") and that such movement increases with the application of heat. Feynman stimulates some interesting issues and questions. Under the principle of conservation of energy, the overall amount of energy remains constant; only re-arrangement of energy/atoms occurs. Feynman states that in joining together, atoms "like certain particular partners, certain particular directions, and so on." In this way he explains why atom combinations (attraction) take particular forms and resist being something other than such forms. This 'integrity' at the quantum level suggests a 'social' context where atoms interact with each other for particular 'reasons' and that an 'inner character' lies at the heart of quantum physics, as opposed to randomness. Feynman also writes that atoms "want" and that "It is the job of physics to analyze why each one wants what it wants." "Want" is an interesting choice of words. He defines inertia by saying that "If something is moving, with nothing touching it and completely undisturbed, it will go on forever, coasting at a uniform speed in a straight line. (Why does it keep on coasting? We do not know, but that is the way it is.)" Does the reference to "coasting" mean that a body is passively carried along in space? If so, carried by what, and what is space? Feynman says we don't really know what energy is, but does it involve a 'power' differential where matter and energy move to states of equilibrium? If this is so, then is this one way that gravity (differences in mass and distance) might have a parallel at the quantum level (weight of atoms as they combine or recombine)? Feynman writes that "all planets push and pull each other." If "pull" is attraction of bodies to each other, it's not clear what push means. For that matter, it's also not clear how "push and pull" relate to Einstein's spacetime curvature (oddly, Feynman discusses Einstein's relativity only briefly). Regarding push-pull (attraction-resistance) Feynman makes some suggestive comments when he states that "the force of electricity between two charged objects looks just like the law of gravitation...." In describing the earth's movement around the sun, Feynman says that the earth impinges "on more particles which are coming from its forward side than from its hind side." Does this mean that the earth "bunches up space" ("particles") as it moves through its orbit and is this related to the earth's gravity? Elsewhere, Feynman states that "the earth can be understood to be round merely because everything attracts everything else and so it has attracted itself together as far as it can!" Gravity is not some (mystical) force at the center of the earth, but a pulling of matter and energy inward, against itself, toward the center. While this is all fun stuff to think about, these Feynman lectures do not enlighten much a lay person's understanding of the uncertainty principle, annhilation and antimatter, and absolute time. His last lecture on quantum behavior is particularly difficult. Feynman is at his best discussing the role of doubt and uncertainty in science. When he differs with the theories of the past or of his contemporaries, he seems respectful enough, saying that they are not wrong, but "a little wrong" or "incomplete." His footnote at the bottom of p. 59 directly challenges those who say wonder and awe are the province of poetry and religion, not science. He also blends life and non-life together when he says that "'Everything is made of atoms....there is nothing that living things do that cannot be understood from the point of view that they are made of atoms acting according to the laws of physics.'" This is Feynman at his best, and a good challenge for those attempting to put philosophy on a solid materialistic foundation. I think that, when reading this book, you have to be familiar with physics and maths. There are a lot of books claiming to be for the neophytes in physics/maths/astrology etc. but, truth be told, there is little to be learned when in that position. Which is why people shouldn't consider this book as being no good just because they haven't reached the paradise of enlightment which was promised to them. Such a thing isn't possible. Not from a single book, as far as I know, and anyway, not from thi I think that, when reading this book, you have to be familiar with physics and maths. There are a lot of books claiming to be for the neophytes in physics/maths/astrology etc. but, truth be told, there is little to be learned when in that position. Which is why people shouldn't consider this book as being no good just because they haven't reached the paradise of enlightment which was promised to them. Such a thing isn't possible. Not from a single book, as far as I know, and anyway, not from this one. I've been studying both maths and physics for quite some time, but in the manner of a poorly prepared educational system, meaning the focus was more on solving problems and ingesting pages of theory and less on really understanding them. And Feynman's lessons really shed some light on the mess in my head. I can't claim I thoroughly understood everything in this book, but I surely enjoyed Feynman's way of following gradually to smaller scales what happens in an apparently simple process, until he reaches the "core" of it. I think it is very rare for someone to be not only brilliant but also a wonderful teacher. Feynman has a very clear and direct style of imparting information. I just love it. Not quite as good as his autobiographical one but still very good. I was attracted to this book not so much by the subject matter, but more by my interest in Feynman himself. He has a solid reputation for being an inspirational teacher and I was keen to see how he managed to achieve this. I was expecting him to take a different strategy from the norm and I wasn't disappointed. To illustrate what I mean, in his lecture on the atom he didn't follow the conventional approach of describing the structure of atoms and building up from there, yet by the end of the talk his students would have heard a physicist's explanation of why blowing on a bowl of soup cools it down. His approach to teaching was so different to what is usually done. Understandably, given the date of the lectures, there have been major developments in physics, and science in general, since the lectures were first presented. For instance, the talk on nuclear physics is very out of date because the make-up of protons and neutrons was not understand at that time to the extent that it is now. Likewise, the lecture covering the links between physics and biology pre-dates the discovery of the genetic code. Therefore, it is pointless reading this book to gain an understanding of the latest theories. Nevertheless, not everything has changed in 50 years and some lectures are as relevant today as they were then. For example, the lecture on the conservation of energy was wonderfully presented, especially the section on potential energy where Feynman used illustrated examples to explain the conservation of potential energy in reversible machines. On the other hand, I felt he made heavy weather of his account of the two slit experiment in his lecture on quantum mechanics and I've read much better explanations elsewhere. To a marked extent Feynman did over complicate much of his material but this is to expected since his stated intention was to teach to slightly beyond the level of the brightest students in each class; of course, whether or not this was the best strategy is open to debate. Overall, this book of six "easy" lectures provides remarkable insight into Feynman's style of teaching. He comes across as someone who knew his subject matter inside out, who had boundless energy and complete self-confidence, and who wanted to stretch the minds of his students. Recommends it for: those interested in a straightforward introduction to quantum mechanical "weirdness"
If you have heard about the "weirdness" of quantum mechanics but don't know what the hype is all about, look no further than chapter six of this book. In chapter six, with his usual down-to-earth approach, Feynman describes one of the most famous experiments in physics (the double-slit experiment) and what it tells us about the way fundamental particles behave. He compares the behavior of "lumps" to the behavior of "waves" before moving on to the behavior of electrons... and the outcome might su If you have heard about the "weirdness" of quantum mechanics but don't know what the hype is all about, look no further than chapter six of this book. In chapter six, with his usual down-to-earth approach, Feynman describes one of the most famous experiments in physics (the double-slit experiment) and what it tells us about the way fundamental particles behave. He compares the behavior of "lumps" to the behavior of "waves" before moving on to the behavior of electrons... and the outcome might surprise you (it surprised early 20th-century physicists, too). This is a classic lesson in quantum mechanics taught by one of the classic teachers of physics. And there's no math required. ...which despite my best efforts remain cloaked in physics' mysterious shroud. "Easy Pieces", these are not. However, Feynman explains the subject matter well—and certainly better than most other folks that have tried to write this sort of thing. Bu kitabın da Alfa Bilim dizsinden yeni çeviriyle baskısı var. Eski çeviride çok fazla hata vardı. Büyük fizikçi Richard Feynman'ın büyük bir öğretmen olmadığını gösteren kitap. Kuantum mekaniği dışındaki konuları liseden ve genel kültürle öğrenmemiş olsam, büyük ihtimalle bu kitaptan anlayarak öğrenmezdim. Adeta üniversitede elektroniğe giriş dersi almış gibiyim : ). Bunun dışında kitap şaşırtıcı derecede açık bir Kuantum bölümü ile bitti. Bu sebepten ve Feynman'a saygımdan 4 puan veriyorum. I have read several other books by and about Richard Feynman: a man whose brilliance and oddness were well known within the Physics community, but sadly only his eccentricities were known by most of the wider world. This book is not really about Feynman, rather it is six chapters excised out of a two-year course of physics lectures he gave at CalTech in the mid 60s. The publisher created this volume (and a second one that I am just getting into called "Six Not-So-Easy Pieces") and a companion aud I have read several other books by and about Richard Feynman: a man whose brilliance and oddness were well known within the Physics community, but sadly only his eccentricities were known by most of the wider world. This book is not really about Feynman, rather it is six chapters excised out of a two-year course of physics lectures he gave at CalTech in the mid 60s. 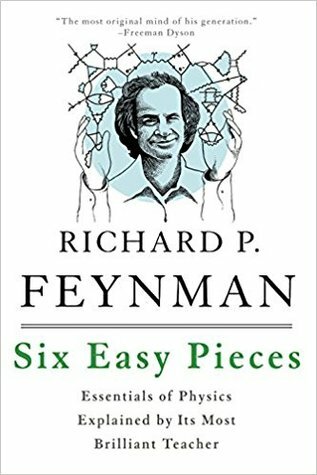 The publisher created this volume (and a second one that I am just getting into called "Six Not-So-Easy Pieces") and a companion audio book in Feynman's own voice about 15 years ago. Although they are not biographical, and I took "freshman physics" a while ago, I picked up these two volumes to read how this man attempted to re-invent the teaching of introductory and intermediate physics. The approaches and "patter" are definitely Feynman's own. His thinking, humor, and enjoyment of "natural philosophy" shine through the pages. Granted the knowledge of cosmology and particle physics contained in this volume are dated (it was 45 years ago, give the guy a break! ), but that only adds a patina of warmth to the presentation. The title is correct: there is virtually no math in this volume (except a bit near the end). Nothing that you need to fear: blowing over it will still get you the gist of the point(s). If you have read any of the other books relating Feynman's adventures as a young (20s) man working at Los Alamos, the pick this up and see how the man lived and breathed physics. You'll be happy you did! I picked up this book several months ago and then dropped it despite nearly finishing it due to the complexity of the last chapter: Quantum Behavior. This by no means implies that the book is difficult as a whole. I thoroughly enjoyed the first three chapters: Atoms in Motion, Basic Physics, and the Relations of Physics to Other Sciences. The method he chose to explain the concepts in these chapters was elegant and easy to understand. He compared our understanding the law of physics to watching a game of chess played by the gods (not personal gods) and we humans as observers knowing nothing about the chess rules. However, I have difficulty with understanding quantum mechanics when he started involving mathematic equation, which I particularly have no formal education. I might as well come back to this chapter once I have a better understanding of mathematics. Overall, I would recommend "Six Easy Pieces" to anyone who is interested in science, physics especially, to check it out. You might have already known the concepts, but you'll be amazed by his styles. I liked 4 out of the 6 pieces, so technically it should be 3.3 stars. I didn't like some of them probably because I didn't understand them, and to be fair I didn't focus a lot while reading it, it was more of a leisure read. The gravitational piece was beautiful. It explained big complex ideas with simple analogies that made sense, some of the laws he discussed I knew already but after reading the lecture it all clicked and the picture was more clear. I didn't like the conservation of energy or I liked 4 out of the 6 pieces, so technically it should be 3.3 stars. I didn't like the conservation of energy or quantum mechanics, which makes sense for quantum mechanics because, well. However I actually studied the conservation of energy and liked it, I was excited to get a new perspective on it and to get deeper intuition but the analogies did not make any sense and it all was just too confusing. Which is why I think rather than a book it would've been better if I just read lectures on the topics that interest me. Fred Rogers teaches high school science. That subtitle may seem overwrought, but it's true. Hawking and Greene have done much to popularize (and fetishize) physics, but Feynman will help the layperson really start to understand it at its most conceptual, basic form. And if you haven't the ability to sustain fifteen years of advanced mathematics, these lessons can still illuminate the marvels of the "mechanism." To be fair, Hawking (astrophysics) and Greene (quantum mechanics) both do a lot for their respective fields as well, but they a That subtitle may seem overwrought, but it's true. Hawking and Greene have done much to popularize (and fetishize) physics, but Feynman will help the layperson really start to understand it at its most conceptual, basic form. And if you haven't the ability to sustain fifteen years of advanced mathematics, these lessons can still illuminate the marvels of the "mechanism." To be fair, Hawking (astrophysics) and Greene (quantum mechanics) both do a lot for their respective fields as well, but they aren't Feynman. Între cele mai impresionante descoperiri se numără cea legată de originea energiei stelelor, care le face să continue să ardă. Unul dintre descoperitori a ieșit cu prietena sa tocmai în seara zilei când și-a dat seama că în stele trebuie să se desfășoare reacții nucleare pentru a le face să strălucească. „Uite ce frumos strălucesc stelele!” zise ea. „Da, răspunse el, și în acest moment sunt singurul om din lume care știe de ce strălucesc ele.” Dar ea a râs de el. Nu a fost deloc impresionată de f Între cele mai impresionante descoperiri se numără cea legată de originea energiei stelelor, care le face să continue să ardă. Unul dintre descoperitori a ieșit cu prietena sa tocmai în seara zilei când și-a dat seama că în stele trebuie să se desfășoare reacții nucleare pentru a le face să strălucească. El título no engaña. Seis temas de física sencillos explicados de manera muy asequible. Ha sido una grata sorpresa, aún así, poder recolocar y matizar algunos de los conceptos que creía entender bastante bien (en concreto: relatividad general y principio de incertidumbre, me han despertado alguna neurona nueva). Não é particularmente ruim, mas o livro definitivamente me decepcionou. Eu já assisti a alguma das lectures de Feynman em vídeo na internet e seu carisma é impressionante, mas há algo que se perdeu na transição entre a oralidade e a escrita. Excellent introduction to physics. Feynman is a great teacher. Awesome introduction (or recap, depending on your background) of the most fundamental concepts in Physics. Expect the most relatable language possible for the depth and fidelity with which these topics deserve to be covered. My favorite excerpt: "The whole universe is in a glass of wine." Sheer poetry created at the end of a lecture, rolling off the tongue of this amazing guy! I listened to the audible recording, which was great for being able to experience Awesome introduction (or recap, depending on your background) of the most fundamental concepts in Physics. Expect the most relatable language possible for the depth and fidelity with which these topics deserve to be covered. Biju dzirdējusi, ka gudras idejas mēdzot rasties pastaigu laikā. It kā ticu, bet tomēr līdz galam nē. Tāpēc jo īpaši bija grūti aptvert, ka klausoties ievadlekcijas par fiziku, manā galvā raisījās ne viena vien praktiska doma un reāli pielietojama ideja. Varbūt tāpēc, ka lektors ir KOLOSĀLS? Vai varbūt tāpēc, ka darbinot neierastas smadzeņu daļas, beidzot, beidzot (!) iepriekš noslogotajām bija iespēja izdomāt kādas domas līdz galam. This is just 6 of the Feynman Lectures (available for free online) that are the most accessible. It's definitely good for its intended audience and comes with Feynman's indelible sense of wonder. Finishing this compels you to read the rest.